Clear surfboard display shows off your board, not the rack! Killer Surf Display Rack. 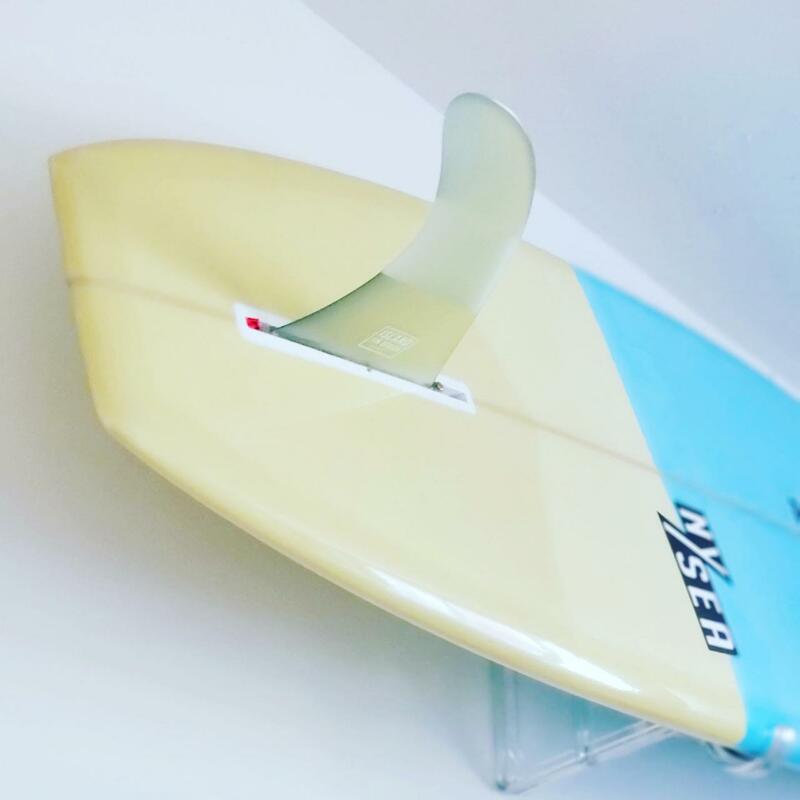 It comes in clear plastic or polished black and provides a very minimalistic reveal so your surfboard is fully on display. 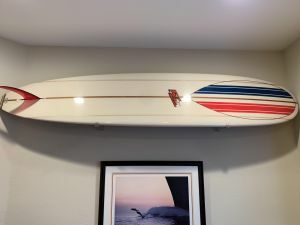 This surfboard rack is built to hold your board out away from the wall enough that you can display your board with the fins in (Anything under and 8" fin should fit well). This is a nice feature especially if you still use your board regularly and don't want to take the fins out after every session. 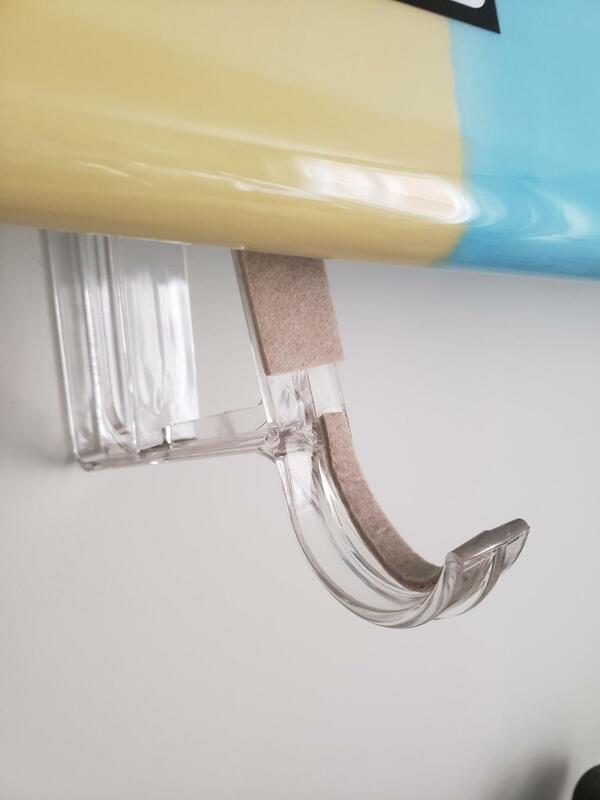 This surfboard rack is made from polycarbonate. It is a super strong plastic that is built to last and look good for many years. Just in case you were wondering they use polycarbonate for motorcycle helmets, bank teller windows, military windshields, etc. It is tough stuff and will more than support your favorite surfboard or longboard. The polycarbonate is a recycled product and MADE in the USA! 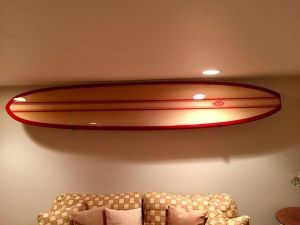 Width of the hook (the part where your board's rail rests): 2.75"
I have some 1960's old school long boards. They are kinda heavy. How much weight can these racks hold? This surfboard rack is made from a polycarbonate that is very strong, however the manufacturer does not have a specific weight maximum they are able to provide for the rack, although they have provided some information for reference - they shared this with me "I have had a 100 lb board hanging from a single rack for over 3 years, as a test, and a solid balsa wood long board, at over 40 lbs, hanging over my bed for 10 years." He also told me about a museum on the east coast that has been using these racks hang some vintage old school boards without a problem. 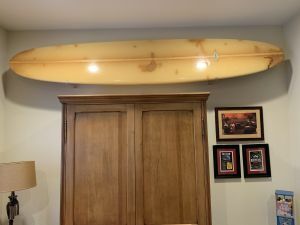 But of major importance is mounting the rack properly -- for this particular surfboard rack, it must be mounted into wall studs. The only other concern, is that although strong, if this rack is mounted outside or in direct sunlight, the ultraviolet light can breakdown the polycarbonate over time. So it might depend on how heavy your vintage boards are, but mounted properly this rack would potentially work well for them. We have a 10' SUP will this rack hold it if mounted on a brick wall? Do you suggest special anchors for brick? 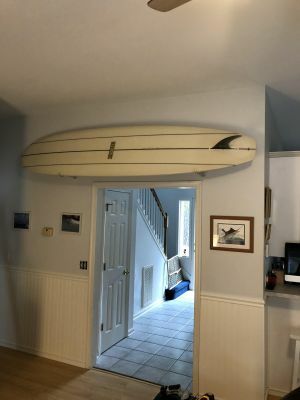 This surfboard rack won't work for holding a Standup Paddle Board. Because the shape, size and weight of SUPs is different enough from surfboards, only some racks will work for either a surfboard or a SUP. 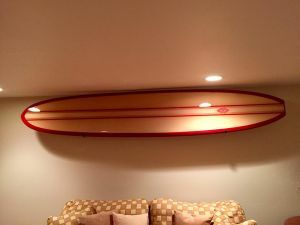 You can find a variety of wall rack options for a single SUP here; the length of your paddle board (10 feet) should not be a problem for most of them. When choosing a rack for your SUP, a couple of measurements to look at is how thick it is, and how wide it is, as some racks are built to hold thicker and wider SUPs. How long it is is usually not a problem because you can set the arms of most wall racks as far apart as you need to support your board. As for mounting in brick, you will need to use masonry anchors - and how well that will work, or if that is an option, will depend on the specific rack. This surfboard rack probably would be fine mounted to brick with masonry anchors, but we could not guarantee it. Easy installation, excellent storage and display. Nice study racks.. I agree, make sure you are mounting in a stud especially with longboards. I mounted a piece of felt backing so my wife can easily slide the board onto the rack and for further protection. The only problem with it has no padding or padding tape to cushion the board from the rack. Other than that it works really well. Rack is very well made and holds a heavy board. Securely hold the board with no slipping. Easy to install, sturdy and allows plenty of room for the fins. Very sturdy , easy to install and the clear looks great!!!! Excellent display rack! Heavy duty. No worry about the board falling. Boards display perfectly because the rack is almost invisible. 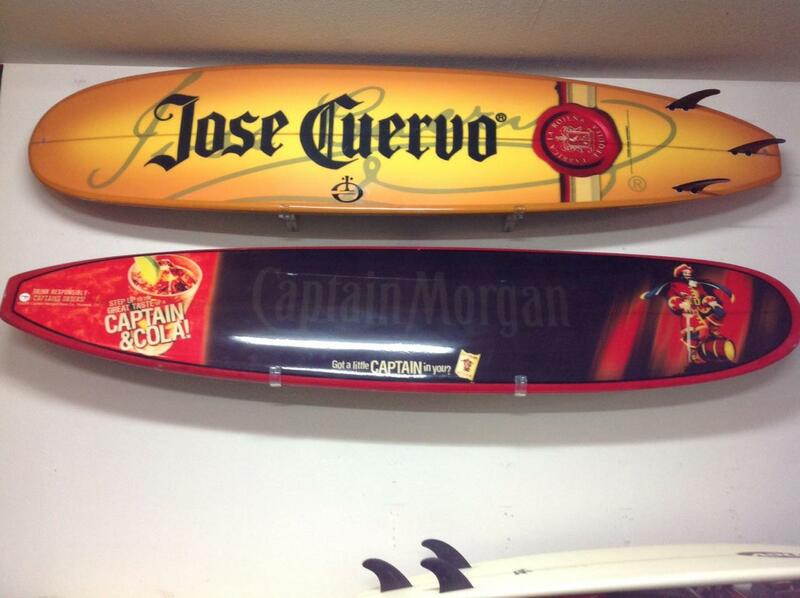 Nice having the option of facing the fins toward the wall if needed without them touching, even longboard fins. I did a lot of research before my purse, and this rack system is the best on the market! I am simply blown away by how awesome these are. Simple and elegant at the same time. One bolt and it's done. I will be spreading the word for "store your board". I'm a SoCal dude transplanted to AZ to be close to the G-kids and my board goes where I go. Clear Surfboard Display Rack Works Perfect! 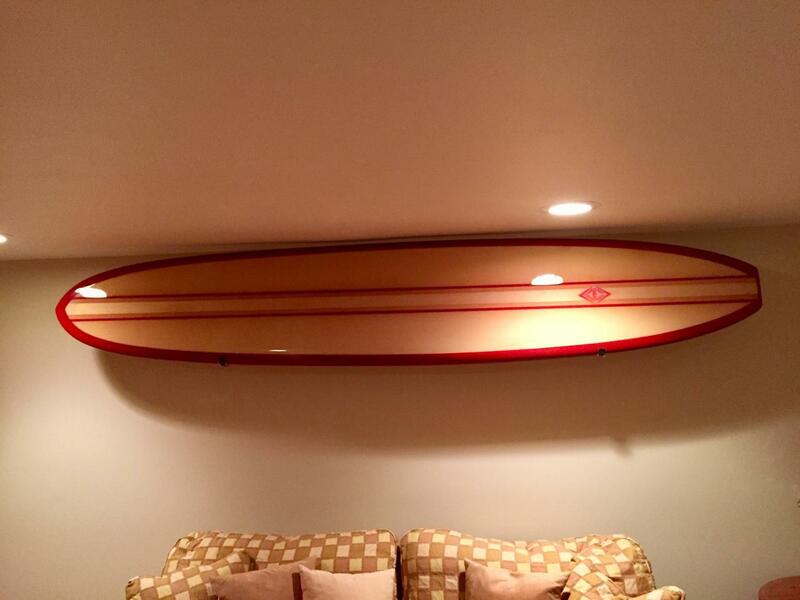 I moved from the coast to the mountains and now display my 9'6" Harbour surfboard. The Clear Rack was the perfect choice. Super easy to install. Looks like your board is floating on the wall. Very sturdy and easy to take your board on and off. The rack is awesome! 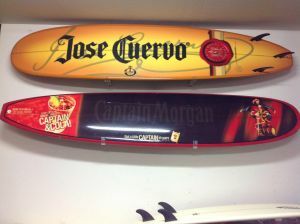 After I get pitted I can just rack up my big 9'8 and have some artwork to enhance the stoke. Highly recommend this product bruh. 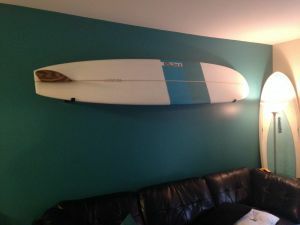 heavy duty, easy to install, just find the studs, we hung 2 boards, a short board and a long board, on the wall. The hangers work great for both sizes. 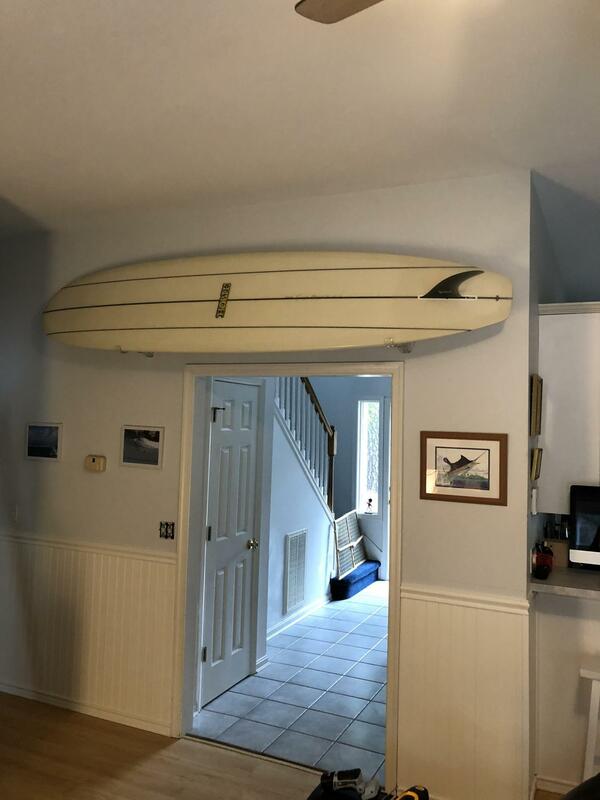 The boards are not standing in the corner anymore, and the boards look great, like art on the wall, easy to hang up and remove the boards to use. I was intimidated over the impending installation, but it was easy to install and it really does hold well and looks great. 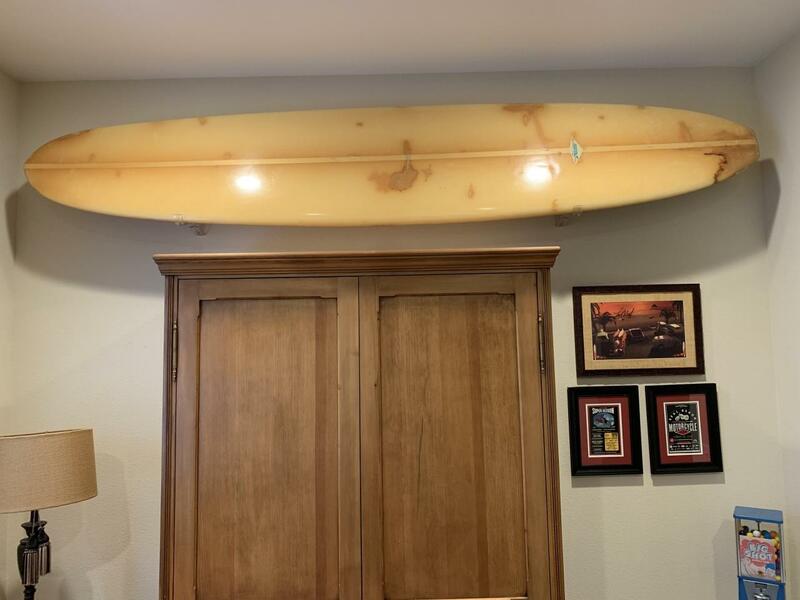 Storing our board inside was a matter of necessity but now with the surfboard display rack it makes it look like a matter of style. Love these racks!!! Really do show off your board!! These are the best for my boards. The CLEAR ones just disappear and all you see is the board...very cool!